Only a six hour flight from the west coast, Hawaii might as well be a world away. While most people think of lounging on the beach and enjoying the great waves and pristine beaches, this state offers a lot of other great options for a vacation including exploring tropical rain forests and kayaking through abandoned sugarcane plantations. Waikiki Beach in Honolulu, Hawaii is a jungle of high-rise resorts. While some are mega resorts - others are still focused on making sure the individual guests feel special and as welcome as possible. From the moment we checked into The Outrigger Reef Waikiki Beach we felt that Hawaiian spirit and that it was something special. While there are other more luxurious and more modern properties available, the authentic and distinctly Hawaiian feel here allows guests to switch out of travel mode... and enter vacation mode. A romantic getaway to Hawaii is one of those ideas that most people only dream of... it's a distant place with exotic sights, food, culture and amazing beauty. For many people though, the price is a major factor that prevents you from exploring this land. Luckily, right now is a GREAT time to visit. Airfare is especially cheap and by being creative with online booking sites like Hotwire.com you can save a ton of money on hotels, cars, and flights as well as complete vacation packages too. Even when I'm not sponsored by the company this is my GO TO site for finding awesome hotel deals any time of year. The Hawaiian Islands are best known for stunning landscapes, sun-soaked beaches, and some of the best surfing spots in the world. However, both it's ancient and colonial history are closely tied to the islands as a source of agricultural bounty and the more I sampled this, the more excited I got to learn more. From pineapples and sugarcane to craft beer, spirits, and even ranches raising some of the world's best beef - this is an area you won't want to miss exploring during your next visit. A ride in a helicopter was on the bucket list for me and thanks to the awesome folks at Norwegian Cruise Line and Blue Hawaiian Helicopter Tours, I can mark it off my list! We took a short flight from Hilo to over the most recent rift zone areas to see the results of the most recent Kiluaua eruption and I must say... the results are humbling, yet thrilling to see both the power and beauty of nature from a completely different perspective. When it comes to fruity tropical drinks, the classic Mai Tai is among the most iconic. It's the Pacific Islands version of the classic Caribbean Daiquiri... or is it? Ironically this classic drink actually originated in California during the tiki bar craze and while two men lay claim to having created it - I DON'T CARE - because the ones found at Don The Beachcomber are the best I've had. It's a more complex recipe and the time and effort is worth it. Here's the recipe so you can make it at home. Hawaii has a reputation of being a destination for a romantic getaway or a family vacation - and it would be great for that of course. However, on our adventure road tripping around the Big Island of Hawaii, I found a lot that guys would enjoy here too. Unfortunately, I was only here for a few days, so I didn't get a chance to do everything that I saw - amazing golf, off road adventures, and laval boat tours to see the molten rock oozing from the earth into the ocean. However, based on what we did see... I'm HOOKED! Hawaii would be an amazing destination to explore with some guys looking for great beer, history, beaches, golf, and awesome food. It was about 6 million years ago that the island of Kauai emerged from the Pacific Ocean. It was over 1000 yeas ago that Polynesian travelers first saw this majestic island rising from the ocean waters. It was over 150 years ago that the first boat of Europeans arrived. And it was just today that our latest batch of guests arrived. Hawaiian Airlines has been flying to Hawaii for 85 years this year and so who better to talk with to get insight into what and why should you plan your next mancation to these sun drenched and wave swept islands! From Luaus to surfing there are plenty of things to do but there's a lot more to it than that. Kaipo Kauka, a flight attendant from Hawaiian Airlines took the time to answer some of our questions. He was born and raised in Honolulu, Hawaii and has been a flight attendant with Hawaiian Airlines for nearly seven years. When he’s not flying, he enjoys surfing, DJ-ing at parties, and spending time with his girlfriend and two kids. Planning a Hawaiian Mancation and looking to avoid the big mega resorts and enjoy a secluded beach but still be close to all the action including golf, swimming, sailing, hiking etc? 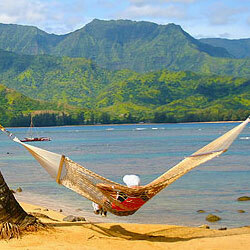 We came across the Hanalei Bay Resort today and it looks awesome.